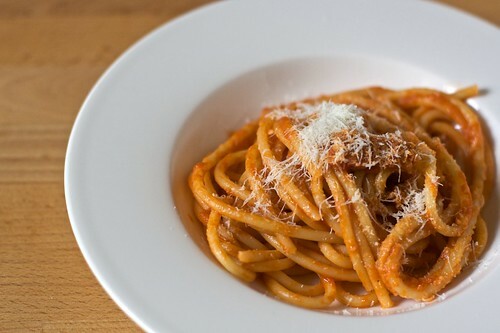 Bucatini all’amatriciana: oh my, how many difficult words are in this simple dish? Amatriciana: it’s a kind of pasta sauce, originating from Amatrice, a village north of Rome. It is a basic Italian dish, but as all basic Italian dishes, every family has its own version and unique way to prepare it! This version is from a Rome friend who was so kind to share it with us on a Sunday lunch and was even kinder to send his family recipe. As with many traditional Italian dishes there are few ingredients, but I did my best to give you a foolproof version of the original recipe. Ingredients are the key element here, so treat yourself: look for the best pasta di grano duro, the best guanciale, the best passata (tomato purée) and the best pecorino. Cut the guanciale in large strips. In a big hot pan on a low fire, fry the guanciale in its own fat with the chopped onion. When the guanciale is beginning to brown, raise the flame to the maximum, add the splash of white vinegar and let it evaporate completely. Lower the flame to medium, add passata, a pinch or two of salt (remember the guanciale is already quite salted), and peperoncino. Let the sauce reduce and thicken on a high heat (careful of the burning split). Salt the water in the big pot and let it go back to boiling. Add the bucatini e cook them for the amount of time stated on the pack, minus 2 minutes. When the bucatini are done, drain them and add them to the pan with the sauce. Keep turning and stirring for maximum 2 minutes, adding pecorino. Serve immediately with more pecorino on top.